End clearances are checked and the 2nd gear -4th gear servo is installed. 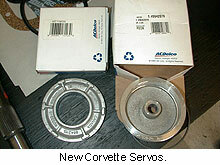 The servos of choice are the Corvette servos. These servos produce approximately 30 percent more volume. There's only one band in this transmission. The servo comes for 2nd, off for 3rd, and comes on for 4th. Historically with a lower volume servo, when you shift, first to second could be a bit drawn out, then 3rd was pretty good because the 3-4 plates (clutch unit) comes on. The higher volume servo equalizes this out a little bit and gives the better 2-3 shift. Frankly there's nothing exciting to see when you look at a shift kit. 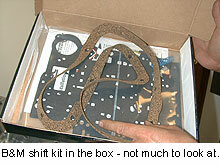 What makes a shift kit shift quicker are better springs and larger passages for fluid. Springs tend to lose their resiliency after a while. The new springs will bring your shift points back up to normal. 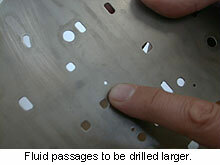 The kit comes with a drill bit and template to drill certain passages out larger in the separator plate. 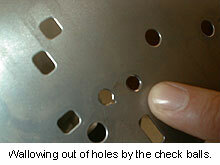 Something to look for in a separator plate is the wallowing out of holes by the check balls. On a 700-R4 it is “normal” to see a little scoring where the 3-4 accumulator bangs into the plate. This may appear as a round or half round score about the size of a half-dollar. Most kits will have 2 stages, Stage 1 - street strip, and stage 2 for performance (hard shift). Others offer all out competition kits. There are 12 different wiring options for a 700-R4 but you don't have to keep the electronics. This one is built as completely hydraulic lock up. There is no electric lock up. This isn't hard to do. All that is needed to perform this modification is to put a check ball inside the lockup solenoid in the bottom side of the pump. The check ball puts this valve in the always-closed position. Normally this is always open and exhausting fluid and when conditions are right the computer grounds that solenoid so it closes and re-routes the fluid up through the input shaft into the backside of the converter and apply the clutch. Then when conditions are right the computer will no longer ground the solenoid and fluid will leak out and the clutch will come off. It is not necessary to have lock-up electronically controlled. In some cases (like a street rod) where you might not have or want the electronics, converting to hydraulic lock-up is a clean alternative. The reason they come from the factory with electronic lock-up is to try to increase fuel mileage by allowing the computer to decide when to lock-up. 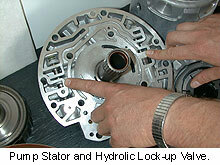 Lock-up transmissions (electronic or hydraulic) generally give a vehicle and extra 3 to 4 mpg on the highway. When the converter is not locked up the transmission cooler capacity is cut down by 1/3rd, so it will also run cooler when its locked up. 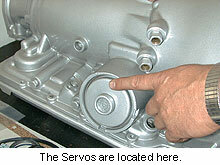 1998 and newer 700-R4 transmissions also contain slug where a converter clutch lock-up valve assembly (GM item) would go. The slug is removed and a valve is installed in its place. When your speed hits above approximately 40mph and conditions are right the valve will come on and allow the hydraulic lock-up to take place. The way a 700-R4 shifts is as follows: 1st to 2nd the band will come on, 2nd to 3rd the band comes off and the 3-4's come on, 3rd to 4th the band comes back on, then when conditions are right the converter will lock - on top of all this. If built correctly a 700-R4 is a very dependable transmission and will give you the advantages of a 4-speed. Here in rural America we've seen farm trucks that have 150,000 to 200,000 hard pulling miles with a 700-R4 and are still going strong. Of course as with any man-made mechanical device… things can break. The stall we chose to go with on this transmission is 2200 RPM. Stock stall is about 1800 to 2000 RPM. The blower increases stall - I'll get into that later and show the torque converter when we install it. The transmission was originally built on the date above by a local shop that is no longer in business. It had to be REBUILT after just 19 miles due to a defective pump and converter. If you want to skip ahead, you can read about it HERE.